Calling A Death in Vienna a satisfying read does not do it justice. newest novel completes the trilogy started with The English Assassin. for another dose of excitement. 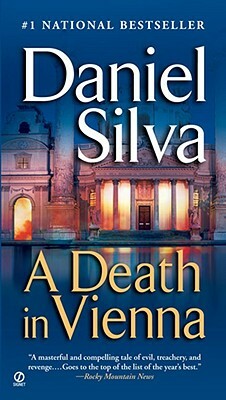 Calling A Death in Vienna a satisfying read does not do it justice. Silva's novels are solidly written backed by thorough research. His newest novel completes the trilogy started with The English Assassin. Central character Gabriel Allon's pursuit of a Nazi War criminal takes him around the world while those wishing to silence him are never far behind. The pace and action are only matched by the wonderful characters Silva has created here, the hit man chasing Gabriel down (the watchmaker) being one of my favorite. I must warn you though, if you are like me and haven't read the two earlier novels in the series, you won't be at all lost with this book, but you will be heading straight back to the shelf to read both The English Assassin and The Confessor for another dose of excitement.